Our goal is uninterrupted care for animals. Also, to keep animals out of shelters and to assure they live with families. A permanent home is the goal. Soupbone Charities provides care for unadoptable, disabled, orphaned and aged animals. 100% of all donations goes to animal care and not administrative expenses. Please donate to the cause. We’ve been doing this since 1995 in the United States and throughout the world. On the soupbonecharities.org website, “Love Continues©” greets visitors. What does that entail? The commitment we make to our animals is for the duration of their lives. Not our lives. As it turned out, Soupbone did not survive me. His heart gave out when he was 12 years old. But I am grateful to have had him for the years I did and proud that his life inspired me to find a way to protect the lives of millions of animals. If so, do you want to make sure they are taken care of when something happens to you Safeguard your animals’ continued care. 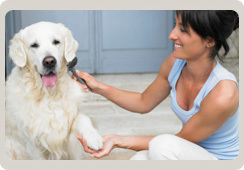 When something happens to the pet owner —such as an accident, illness, or death—then the Pet Protection Agreement® pet trust becomes critical.